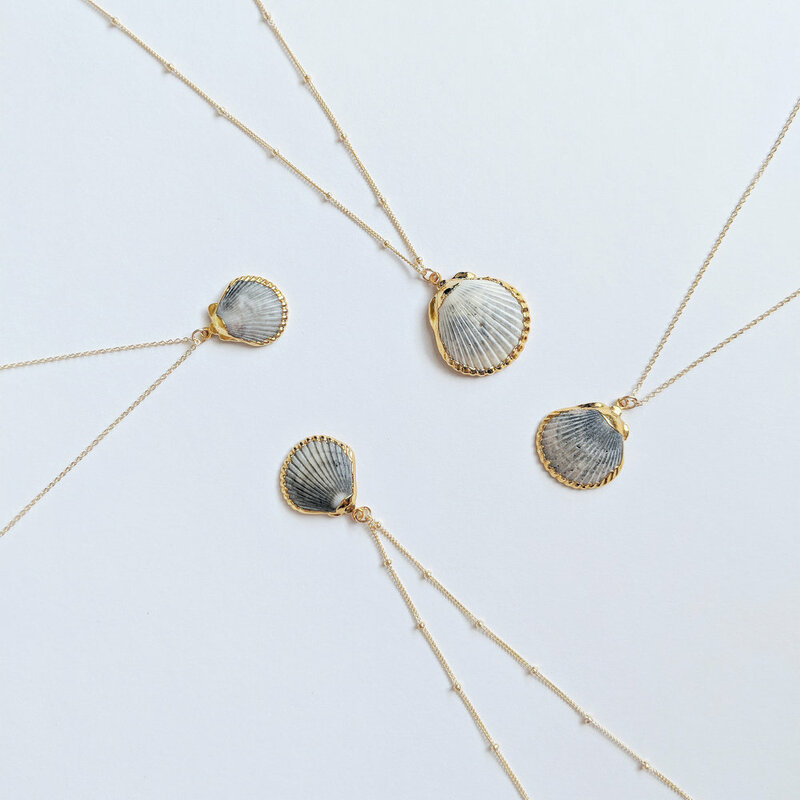 Without further ado, meet Janell Rowland of the eco-conscious jewelry brand, Clam & Clasp! We got to ask Janell some questions about how, when, and why she started her small biz! Here are her answers! At Clam and Clasp our mission is to speak for the sea and share its beautiful creations. When did you start Clam & Clasp? I have been working on the business since January of 2018, and launched my e-commerce site in late March of 2018. No, I actually grew up watching my parents start a couple small businesses and remember thinking I didn't want to do something like that because of the amount of stress and responsibility it entails. Like I mentioned, I grew up watching my parents run their own companies, so I was exposed to the entrepreneur mindset at a very young age. After I graduated from college (with a major in Marketing and a minor in Accounting) I started working at an advertising agency. After almost 3 years there I started to feel a lack of greater purpose in my career. I realized the goals I was working towards were not what I wanted to spend the next 5 years or even 6 months of my life achieving. I wanted to wake up every day and know that I was working on something I was passionate about and that my hard work was going towards making a positive difference in the world. I also started to have the desire to be able to channel my drive and motivation into working for myself and building something I could be proud of. Around this same time, I watched the film "Chasing Coral", which opened my eyes to the extent of dangers currently facing our oceans and planet, and inspired me to do something about it. I didn't decide I wanted to start a business and then try to come up with ideas of what to do. An idea just sort of came to me that would allow me to work towards a cause I cared about, and I was at a point in my life where the timing was as “perfect” as it was ever going to get. I’ve learned and continue to learn so much even in the small amount of time I’ve been working on this company, it’s hard to narrow it down! One thing I learned fairly early on was to not take everything so seriously. I was so hard on myself right before my website launch, to the point where I lost a lot of the excitement and fun that inspired me to start in the first place. There are so many ups and downs in owning a small business. One day I’ll feel positive and motivated, and the next I’m paralyzed with fear and doubt. And trust me, I’m still working on this, some days I’m better at it than others. But I think if you’re allowing yourself to have fun with your business and be inspired by it, it will show through in the work you put out. You are more than your business. I think for small business owners it can be easy to equate personal growth and success with that of your business, and while that can be true in some ways, for me, I need to remember to have balance in my life. To celebrate personal wins like taking good care of my body or building strong relationships, and not equate my self-worth solely to sales numbers or growth stats. I feel that my drive and passion for the mission that I have for the company is an advantage. It’s easy to get lost and overwhelmed with daily stresses, but in those moments when I remind myself of my mission to make a positive impact and create a company that inspires others to make positive impacts as well, it helps me pull myself out of the rut and think about the big picture. I wish I was better at the accounting side of my business. Although I minored in accounting and have some background experience, I’ve never felt fully comfortable with that aspect of the business and know there is so much more that I could learn. Having a mission that customers can join in and feel a part of is an important distinguishing value for Clam & Clasp. The uniqueness of the products and letting customers customize their piece by choosing their shell also creates a memorable experience. Having a piece of jewelry that is totally unique, is your own little piece of the sea, and supports a great cause is something that is really unique and special. Being in the fashion industry, trends can change very quickly. One “trend” that I do see starting to develop and that I think will continue to become more important in the coming years is sustainable fashion. More and more customers are seeking information about the products they choose to buy, including who made them, how they were made, and how the processes used can affect the environment and the people involved. I think we’ll definitely see handmade products start to rise in popularity. Fashion truly is a form of expression, and being able to know and tell a story with what you’re wearing is becoming important to consumers. Ready to get your small biz idea off the ground like Janell?